Will Healthy Lives produce healthy men? The government has published its latest health white paper, Healthy Lives, Healthy People, setting out its public health strategy for England while passing responsibility for implementing it from the NHS to local authorities. 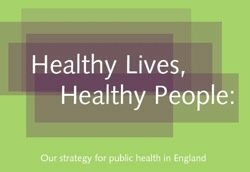 Healthy Lives, Healthy People: our strategy for public health in England looks at the broad determinants of health such as physical activity and work. The white paper highlights the difference in life expectancy between men and women and the seperate evidence paper contains a number of important statistics on the health of men. It also confirms that NHS Health Checks will continue - these checks have been welcomed by the MHF as they are designed to work in a range of settings not just at a GP's practice or hospital clinic and have the potential to engage men who would not otherwise seek help. The paper continues the trend established in this summer's NHS white paper: Equity and excellence - Liberating the NHS of moving responsibility out of PCTs to other local organisations. Responsibility for public health will be moved from the NHS to local authorities with local directors of public health sitting within councils rather than PCTs. The NHS public health budget, estimated at £4bn, will move too and be ring-fenced. There will be a new organisation Public Health England which will be part of the Department of Health. It's not all set in stone. Some aspects of the paper and its supporting documents are up for consultation and some of the changes will need to pass through parliament but the plan is for these structural changes to happen alongside those planned for primary care. MHF CEO Peter Baker said 'There is a lot to welcome in the white paper, for example we have found some of the best examples of action to tackle men's health in areas where the local council and the NHS have worked together. It is certainly good news that Public Health England will have a duty to work within the public sector equality duties and that the Commissioning Board will support and incentivise GPs to play a role in public health. Some sections of the paper refer to other forthcoming publications - for example, specific papers on mental health, sexual health and obesity, all areas in which the Forum has policy experience, will be published in 2011. The Forum will consult stakeholders to develop its response to the government's paper.